Our photovoltaic system produces more energy than we need ourselves. Thermal energy can be stored and exchanged thanks to a pipe system within our headquarters' buildings. This heating and cooling system makes radiators almost redundant. We recently received the KlimaHaus Work & Life sustainability seal for our holistic approach. Our headquarters are much more than just a workplace for our employees. They are a place designed to create a sense of community, where work, free time and sports come together. They are the heart and soul of what we do. 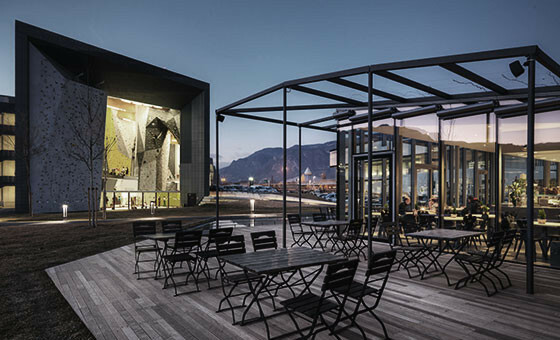 The building should therefore reflect our philosophy as well, with a groundbreaking, holistic environmental concept and bold, innovative architecture. This comprehensive approach can be seen in many areas. The building was constructed using natural materials; wood, loden, glass, steel and cement. As well as this obvious commitment to nature, it was just as important for us that 90 percent of the companies involved in the construction should come from the region. Behind the building facade hides a so-called concrete core activation: Thermal energy can be stored and exchanged thanks to a pipe system within our headquarters' buildings. This heating and cooling system makes radiators almost redundant. The building is also insulated by a green roof, the Living Green Roof. At our headquarters alone the photovoltaic system produces 460,000 kilowatt hours. 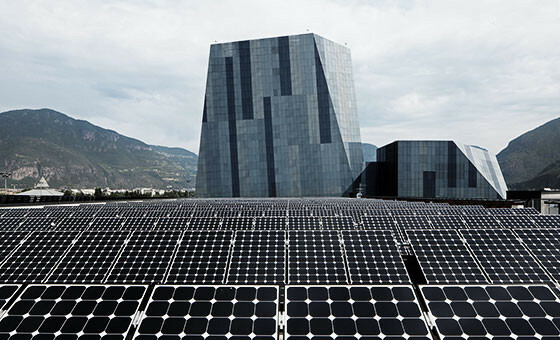 Together with our two other installations in Bolzano, we produce more energy than we need ourselves. While we hope to continue generating as much of this green energy as possible, there is something else we want to avoid creating: Waste. Even though only minimal waste is generated at our headquarters, we still endeavour to train awareness here as well. In the kitchen and at most of the coffee machines for example, we have ceramic cups instead of plastic ones. There is also a waste separation station on each floor. And it's only logical that we also recycle in our central warehouse, where cardboard used for transportation accounts for the largest proportion of the waste. Where possible, this is reused or compressed and sent to a local external recycling partner. We recently received the KlimaHaus Work & Life sustainability seal in recognition of our holistic approach. We're particularly proud of this.